Learning Builds, as I’ve come to call them, are something I’ve done for years. Teaching and helping kids build their first computer is absolutely my favorite part of this job. There’s something awesome about building your first system, but there’s a lot that goes into it. From finding the right motherboard and processor, to pairing a power supply with your video card that’ll properly power it when you’re gaming… it can all be pretty daunting. When I started doing Learning Builds years ago, it was born out of frustration with my own first build when I was a kid. The shop wasn’t helpful and the clerk that sold the parts to me didn’t have any hardware knowledge. The industry has come a long way since then. There’s literally thousands of options thrown at you when you start planning a custom-built system. 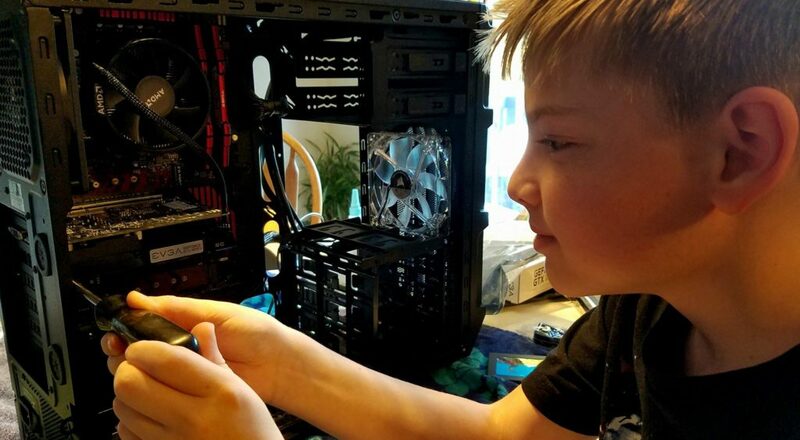 So many options, in fact, that a lot of parents looking to help their kids are overwhelmed and end up buying a more expensive pre-built gaming system. We’ve built gaming systems from $500-2,500. Trust us, you can get a LOT of system for your money when you go custom-built. Learning Builds makes it simple. Here’s the process: We take a couple of key factors (your budget and the list of games your kids want to play) and work up some estimates. Then, we’ll set up a time to build it. All we need is a couple of tools and your excited kid. This whole process is supposed to be fun, and that’s what Learning Builds is all about. Copyright © 2019 Effingham Computer Sales & Service. Powered by WordPress. Theme: Spacious by ThemeGrill.